Sieve production art exsits very long in Chinese conjuring history, two tubes are used to produce many objects for audience as gifts including toys, food, etc, not only to feast your eyes but also your appetite. 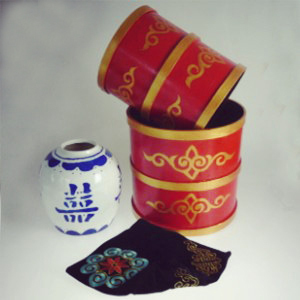 This item is made by chinese traditional handicraft, practical and durable. Start with showing two empty cylinders with propitious clouds design around, very beautiful. Performer takes them and place one inside the other, with a magic blow, endless objects are produced from inside: toys, fruits, balls,food, etc.The two tubes are again shown empty and upon being nested, instantly a porcelain jar full of water is produced from the tubes, which is so large and impossible to be replaced in the tubes again. You are supplied with the two cylinders, handkerchief, the wine jar and instructional video. You provide the objects that are produced from the tubes. There are 2 colors of the handkerchief-black and red,we will send the handkerchief with its color at random.